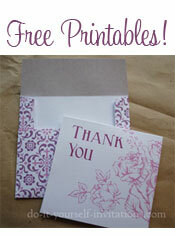 These were created using Bazzil cardstocks and Cricut cartridges. 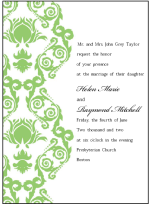 The cream color paper was sent through the printer to have our names, date and location printed on them. 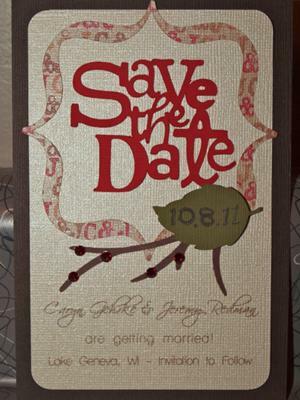 I then added the die cuts of "Save the Date", the branch and leaf (which has the date written on it). The most difficult part was the frame. I couldn't find pattern paper that I liked, so I decided to make my own. I used small stamps with our intials (C+J) and stamped across the entire page. This took FOREVER, but the custom look was well worth it! The frame was cut also using a Cricut die cut. I experimented with different types of glue. I'm actually a scrapbooker more than a card designer, so my works of art are normally placed under page protectors. I found spray adhesive worked the best to ensure the die cuts were fully glued down to the paper. I also used a 3d adhesive square on the leaf to make the date stand out a bit. Finally, I added a few Swarvorski rhinestones to resemble berries on the branch.